I don’t think this phenomenon is limited to the Lex. It seems pretty common. A bar–straight, gay or otherwise–gets popular. People attach themselves to it and form a clique-ish attitude about who “belongs” there and who doesn’t. This attitude calcifies and over time, the people inside the bar become unwelcoming dicks. (it doesn’t help that the people who give off this attitude are the type of people who spend a lot of time in bars–ie: alcoholics) Potential new customers are scared off. Slowly but surely, the bar’s business wanes and eventually, it closes and everybody laments the passing of another longstanding institution. Yeah, that does sound familiar. "Pop's is not going away," says new owner of Pop's! The former Nap's 3 will reopen soon as Virgil's Sea Room! Bars close. People move on. How old are you?!? maybe the bar owners were tired of catering to the crowd represented by the guys pictured. i certainly wouldn’t look forward to going to work every day if that was my clientele. Wait, I thought Rick WORKED at pop’s!? You are correct, he did work there. oh no! 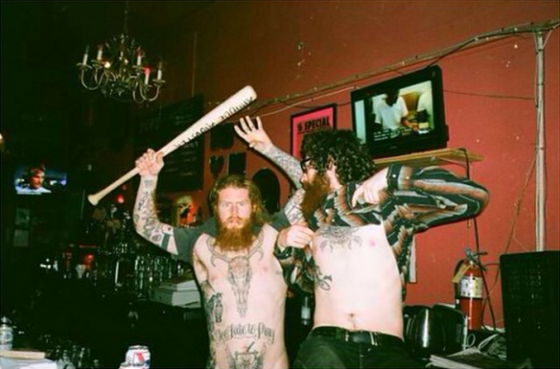 tattoos and beards, so spooky!! Except, you know, some bars do seem to hang on forever. Might be worth analyzing that. Owners of bars come and go yes… during the late 90′s the city put a moratorium on bars in the mission if you didn’t know. Nobody went there anymore–it was always too crowded.